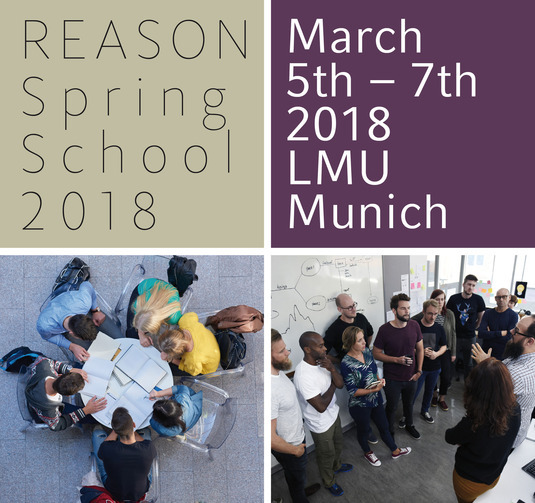 The application deadline to the 2nd REASON Spring School was October 15th 2017. The International Doctoral School “Scientific Reasoning and Argumentation” (REASON) invites researchers from all fields relevant to the study of SRA to a three-day spring school in Munich. The 2nd REASON Interdisciplinary Spring School 2018 on "Advances in measuring scientific reasoning and argumentation" will take place from March 5th to March 7th 2018 in Munich, Germany. The International Doctoral School “Scientific Reasoning and Argumentation” (REASON) invites researchers from all fields relevant to the study of SRA to a three-day conference in Munich. The program will bring together diverse perspectives on current directions and advances in the measurement of SRA. In addition, we will also discuss the use of evidence in research and practice across domains. The conference aims to promote mutual awareness and appreciation of the different disciplines as well to further consolidate possible cross-disciplinary collaboration. For further information please visit the REASON Spring School 2018 section of the website. We are looking forward to welcoming you to our event! In March 2018 LMU Munich will also be host to the INHERE Conference on "Learning through inquiry in higher education: current reasearch and future challenges" on March 8th and 9th 2018 at the Medical Center of the University of Munich.